* ... HOUSING MESS: I received a thoughtful note from local Realtor Sally Morrison on the housing crisis. She recalled a meeting in 2001 at Hodel's Restaurant that was hosted by lending institutions, right before the housing run-up. At the time the government was pushing for more home ownership and loosened regulations to make it easier for people to qualify for loans. "So what does the federal government do? They tell Fannie Mae and Freddie Mac that they no longer have to require an affidavit be signed by all parties that there are no other loans on the purchase of the property. So here come the 20 percent second and sometimes the 25 percent second to cover the closing costs... Everyone is happy. The real estate agents are selling houses like crazy, the lenders are making two loans at the same time, the price is going up 10 percent a month, appraisers can't keep up with the work and investors see that real estate is doing much better than the stock market so they are driving up the price a little more." Her point? "Saying that the banks are greedy and unscrupulous is not fair. The federal government wanted the banks to do just what they did. Saying banks should not make money is like putting fifty 21-year-old men naked in a Hooter's with naked waitresses and telling them there are no rules, and then wondering why there are all these newborn babies in nine months.... if the federal government would have left good enough alone we would be fine today... To own your own home requires a little integrity. You have to save some money or you have to do service for your country in the military and learn integrity there. But if you stay in school and get a good job and make a habit of saving money a home of your own will come." Well said, Sally. * ... SWEETHEART PENSIONS: You wonder how the stink over City Fire Chief Ron Fraze's retirement will affect the November ballot measure that would reduce pensions for future police and firefighters. Voters are up in arms and the unions are terrified that they might see their pensions reduced. We can thank our City Council for failing to deal directly with this issue and putting it on the ballot. * ... OVERHEARD: A man who owns a home on the Kern River across from Hart Park said every Monday homeowners are greeted with a tsunami of trash (soda cans, diapers, fast food wrappers) washing up on their property from the weekend crowds at Hart Park. "If my wife and I can keep a couple acres clean ourselves, why can't they pick up after themselves?" * ... STREET SCENE: Spotted near Cafe Med on Stockdale Highway was a person celebrating the overturning of Proposition 8 with a sign that read, "Ken Mettler Don't Hit Me!" 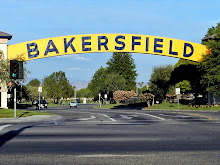 * ... OLD BAKO: Reader Johnnie K. Adams has called Bakersfield home for 64 years and his family has been here since 1911. He shared a few remembrances: "Remember the old quarry at the 24th Street bridge where you'd be walking in two inches of water and then walk into a 50-foot hole? A lot of lives were lost that way. I still can't go into the river there. And about Mother's Bakery. They had jumbo, jumbo cream puffs (real cream, only) but you could only buy them in winter. Remember the asparagus fields on Real Road? 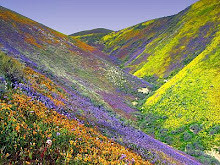 And remember mushrooming at Stockdale and Brundage on Kern County Land Co. land? You would walk from Brundage to the river." * ... OLD TV: Local television pioneer Don Rodewald wrote to say how pleased he was to see his name in this blog regarding his 17-year afternoon show on KERO-TV. "Everything was live, film or slide. The two black and white cameras were tube and four lens. 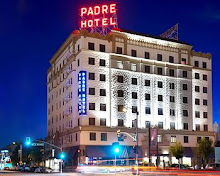 The KERO studio was a small section of the El Tejon Hotel at Truxtun and Chester Avenue. There were three announcers-George Day, Harry Mitchell and Don Rodewald, the last one alive. But cable hadn't arrived yet so people still remember those early days. Some even remember when my wife and I spent two weeks in a bomb shelter at 18th and Chester during the Cold War. Sorry to ramble but fun to reminisce." 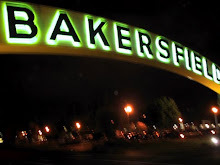 * ... BAKERSFIELDISM: Reader Walter E. Stewart says you know you're from Bakersfield "if you remember Starbuck's small one-room neighborhood grocery stores in the four hundred block of Monterey Street, circa 1920 and 1930s). only in Bakersfield - a sign that reads "Budweiser and tongue" outside Chalet Basque on Oak Street. Don Rodewald is such a perfect gentleman, a wonderful man! I'm glad to read about him and his story about KERO. Thanks for including it.